Earlier this month IDW announced they’d be ending their long-running Star Trek comics title “Boldly Go” with the #18 issue next spring. This Kelvin-universe title has been consistently fun, adventurous and imaginative. Post Star Trek Beyond we’ve seen Spock and Uhura living together on New Vulcan, Scotty teaching at the Academy, and Jaylah learning what it means to be a Starfleet Cadet. But the series will end on perhaps its most ambitious storyline yet: the current “I.D.I.C.” Saga, a six-episode miniseries about the convergence of multiple parallel universes, and multiple fascinating Enterprise crews. We’ve also met gas-people and and a female Spock who’s serving as Captain of the Enterprise after Kirk’s death. Members from each crew are grouped with people from different crews, to make for some interesting conflicts and dilemmas. 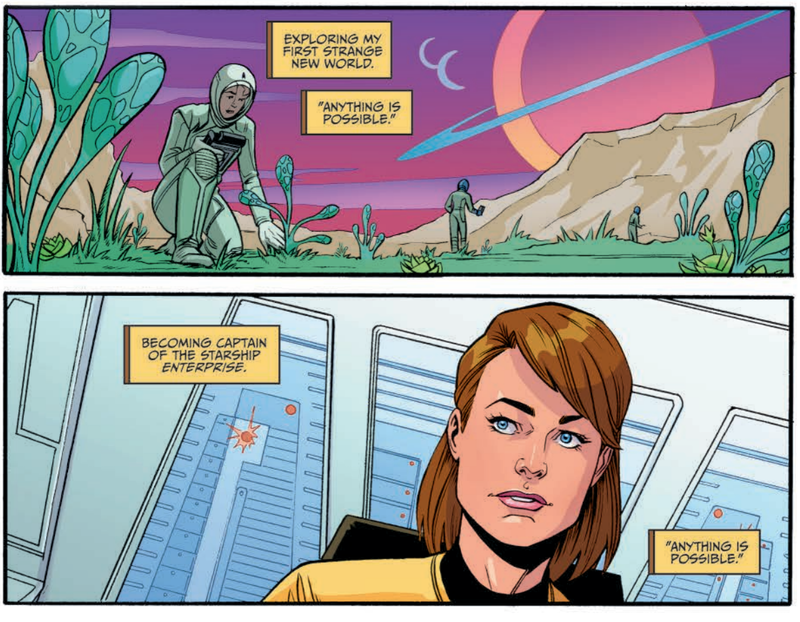 But what makes me most happy is seeing the return of Jane Kirk and her gender-swapped Enterprise crew, first introduced in the “Parallel Lives” comics in 2014, when Sarah Gaydos took over the helm editing IDW’s Trek titles. I was pretty pleased overall with their first appearance and how it generally challenged gender stereotypes by depicting similar character traits in different bodies, pushing the audience to ask, “Well why couldn’t Kirk have been a woman?” It was great to see them get another cover and significant page space. Issue #14 starts with Jane Kirk remembering her father teaching her growing up that “anything is possible” and that’s still a message that’s so important for girls reading these books. But still, even with this optimistic and imaginative spirit to guide you, you might find yourself reading this series and looking at the interactions between Tree-Kirk, female Captain Spock, gas-person Scotty and Uhuro (male Uhura from the gender-swap crew) and asking if this miniseries has bitten off more than it can chew. So far the crews that interest me the least are the ones whose similar existence to our main crew are the most difficult to explain: the Botanicals, the cyborgs and the gas-people. The other crews all feature a few compelling characters that I want to know more about, like Jane Kirk, Grayson, and female Captain Spock. I hope the last three issues of “I.D.I.C.” can do them justice with so many other characters in the mix. While our heroes are many in this series there are fewer villains and two are particularly exciting. The first is a rogue Kirk with a nailed-on eyepatch (à la General Chang) who commands a Klingon ship and goes by the name “The Orphan.” The second is a female Khan (who’s not white-washed, unlike CumberKhan and the female Khan in “Parallel Lives”) who rules an empire of Augments and enslaves humans. There is a ton of potential in this miniseries and I’m excited to see how writer Mike Johnson delivers on it. How will all the bands of crew members get back to their rightful ships and rightful universes? Will characters develop based on meeting their doubles from other universes? Will there be an epic face-off between Jane Kirk and Khan? Hey, anything’s possible! And once that’s done, don’t fear! When the “Boldly Go” cancellation was announced, Mike Johnson took to Twitter to say: “Boldly Go is wrapping up but you have not seen the end of the Kelvin cast by a long shot.” We’re also getting a Star Trek: Discovery Annual devoted to Lt. Paul Stamets, so I am really excited for that. Have you been reading along with “Boldly Go” or any of the other Star Trek comics titles? Let us know what you think in the comments below! I’ve been reading Star Trek comics since DC published their first series post “Wrath of Khan.” In comparison to what’s been done before, “Boldly Go” and IDW’s previous take on the franchise, “Star Trek,” has been a solid and enjoyable but timid read with middle-of-the-road art. The gender swap crew issue that preceded the “IDIC” story line was neat, neat enough that my non-comics reading coworker bought it to give to his daughter. I really enjoyed the Khan origin mini-series that wraps up “Into Darkness” and the humorous “Academy” mini-series. 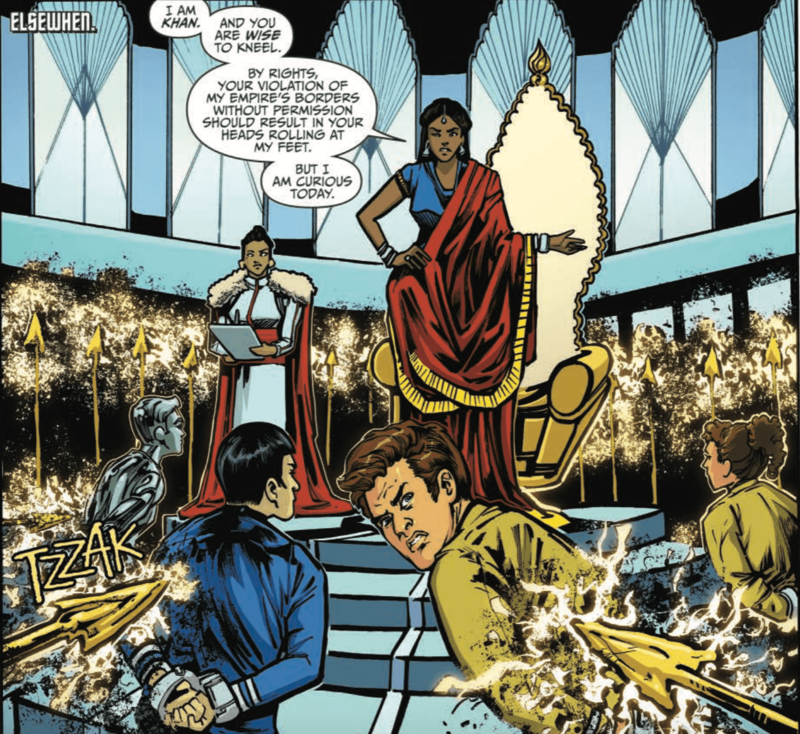 A handful of Mirror Universe issues featured alternate, evil versions of the Abrams crew – complete with Simon Pegg Scotty with a mustache – and those were fun. However, The Kirk-Spock-McCoy dynamic that I enjoyed pre-Abrams – and that really shined in Peter David’s run on DC’s early-1990s Star Trek series – doesn’t come through in IDW’s book. I was rather excited to see IDW revisit classic TV Original Trek story lines but they abandoned that approach after a year and pursued alternate timeline crossovers with Deep Space Nine and more generic space opera stories. In the end, Trek has been about characters as much as it’s been about adventure and the characters don’t shine in this as much as I want them to. I sense that CBS or Paramount threw a bunch of restraints on the comic’s scribes and it’s reflecting in the final product. Newer Trek fans will probably like these books so I would definitely recommend it to them.